Norpro Scalloped Cookie Biscuit Cutters & Tin Case 11 Piece Set 3/4" - 3-3/8"
With this Deluxe Pastry Blender, the process of making a pie crust is as easy as making the pie filling. The perfect 2 in 1 tool for pie, cookie and pizza dough. Easily make a uniquely delicious Italian dessert! Recipes and instructions included! Measures 5 Â¾â€ X Â¾â€. With Norpro seamless cannoli forms, this has never been easier! Simply cut a 5" circle of dough, wrap it around a tube and drop it in the oil. Once cooled, the tube is removed and your beautifully browned cannoli shells are ready to be filled with your favorite sweet or savory fillings. Do you really want to impress your friends and family? Tasty little puff pastry horns filled with sweet or savory little bits are sure to blow them away. Although, these do come with an excellent recipe for puff pasty, the stuff you find at the grocery store works equally as well (and takes A LOT less time). Simply wrap the horn with pastry, bake and fill. While the traditional filling may be creams, puddings, custards., or fruit, horns filled with smoked salmon tartar with a dollop of crÃ¨me fresh and dill makes an unbelievable appetizer. Be creative and you won't be disappointed, and your quests won't either. Place on top of pie crust before baking, leave on pie throughout cooking time. Allows pie to rise in middle, prevents spillage and protects crust from burning. 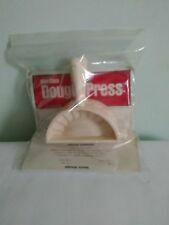 Use to gently mold pastry dough into quiche or tart molds. Great baking depends on more than just the ingredients. Handy baking accessories help even the beginning pastry chef turn out professional results. Multi purpose silicone mat with measures. Ideal for rolling out dough, chopping, slicing and dicing. Measures dough or crusts from 6 to 15. Overall measurement: 19.5 x 15.5". Norpro Mini PIE CRUST SHIELDS Set of 4 Silicone Heat Resistant 6.25" x 6.25"
Set of 4 Mini Silicone Pie Pan Shields. 2 Norpro 9" and 9" " Reusable Aluminum Pie Crust Shield New Protect Edges From Burning GUC 2nd one is adjustable for smaller or larger pie. I do my best to take pictures that show any flaws or defects. Pie funnels are used in baking pies and prevent the pie from boiling over in the oven by allowing the steam created when the fruit filling or other contents are cooking to escape from inside the pie. How to use: Line the pie dish with pastry, place the bird in the centre, put in the filling around the pie bird then put a pastry top on but allowing the pie bird to stick out of a hole in the pastry . Pinch crust around the bird's shoulder, allowing the head to stick through the pastry. The bird will release steam through his mouth vent during baking and help to prevent juices from boiling over in the oven. This pastry blender is top notch commercial quality. The perfect 2 in 1 tool for pie, cookie and pizza dough. The large roller, 4.25 inch/11cm, smoothly rolls out dough and easily achieves the exact consistency, thickness, width and length. The small roller, 2.5 inch/6cm, makes it easy to fill in dough to the edges and ensure uniform depth around the inner rim of the pan. Also ideal to crush nuts, crackers, cookies and bread crumbs. Stainless steel rods balance the wood rollers. Hand wash.
With Norpro's mini cannoli forms, making cannolis at home is easier than ever! The stainless steel six piece set is dishwasher safe, making clean-up a breeze. Mini Pocket Pie Mold - Red. Make sure your pie crusts bake evenly and without air pockets. Norpro Marble Rolling Pin - with hardwood stand. Heavy weight marble makes rolling dough easier and quicker. Norpro 3073 Hardwood ROLLING PIN 13" x 2.75"
Norpro 3073 Hardwood ROLLING PIN. High quality hardwood rolling pin with nylon ball bearings, makes rolling dough easy. Made of high quality hardwood. Pastry And Pizza Roller. The perfect 2-in-1 tool for pie, cookie and pizza dough. Also ideal to crush nuts, crackers, cookies and bread crumbs. Large roller: 4.25" / 11cm. Small roller: 2.5" / 6cm. The large roller smoothly rolls out dough and easily achieves the exact consistency, thickness, width and length. The Norpro Pastry/Pizza Roller isthe perfect 2-in-1 tool for pies, cookies and pizza dough! 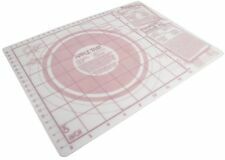 Easy to use on your pastry mat/cutting board or directly in the pan! This relatively small roller makes it easy to fill in dough to the edges, smooths edges and sides, and ensures uniform depth around the inner rim of the pan or dish. Three tools all-in-one for your pastry and pasta needs, you can crimp, cut and seal with the Norpro Pasta/Pastry Cutter. 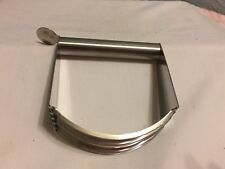 Norpro Pasta / Pastry Cutter Features. Bake authentic Italian food like a pro with Norpro's Ravioli Rolling Pin! Norpro Ravioli Rolling Pin (1.5" Squares) Features Pin:2.5" x 18" x 2.5" | With Handles: 23". High heat resistant, heavy duty mat provides instant, easy release without the use of grease and promotes even heating. Nonstick silicone. Promotes even heating when used as a baking liner. Long lasting and durable, heavy-duty fiberglass wrapped in FDA and LFGB approved silicone. Choice of seven strip widths: 1¼, 1?., 1½, 1¾, 2, 2¼, and 2?". Type Wheel type. Dishwasher Safe Yes. Dishwasher safe.